Infographic: How Much Cash Do You Carry? How much cash is in your wallet right now? Chances are it’s not a very large amount, according to survey results in the July 2013 issue of MONEY Magazine. When the magazine asked readers how much cash they carry, 42% responded that they only carry between $1 and $40. Some of the other statistics MONEY shared seem to show the downfall of cash even more. 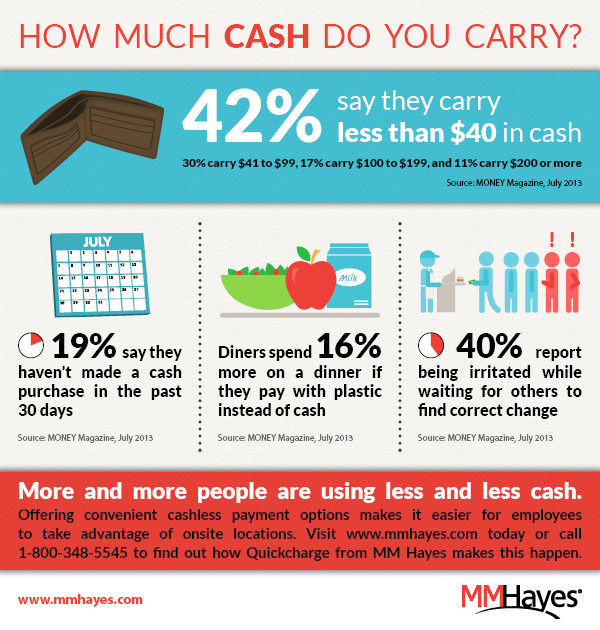 Take a look at the infographic below to see how often we’re choosing cashless payment options instead of cash.